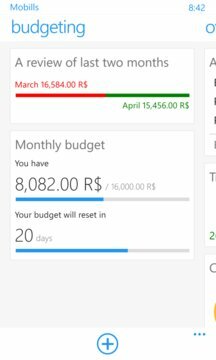 Mobills Financial Education is an App of financial control that has as goal manage your expenses and spending, working as a personal manager for Windows Phone. 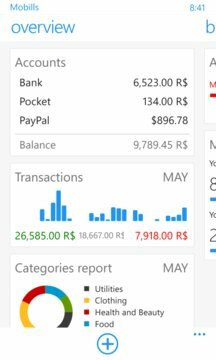 With Mobills, all your expenses and incomes are categorized and shown in graphics and reports that help you analyse your financial life, being able to easily control your daily outlay. Mobills Financial Manager is a complete option for those who wish to organize and plan their expenses. The income and outlay system works as an automatized financial spreadsheet with a simple and intuitive interface, being used as a guide to your pocket. Mobills has many complete features, being the best option to manage your monthly expenses and spending. Easy to use and with a clean interface, any user is able to manage their daily spending without any economics experience. Be a part of our community! !